If you haven’t gotten to spend much time out in the field recently, it can be easy to forget just how physically taxing a day of hunting can be. Elk hunts can be particularly demanding due to the size of the animal and the steep terrain we cover during the course of a hunt. Before you embark on your next elk hunt, it’s important to prepare with some training to make sure you’re in good physical condition. This way, you’ll be able to make the most of your hunting experience. Let’s start with some light cardiovascular conditioning. Go for a brisk walk, and alternate 10 minutes of walking with 3-5 minutes of running. Gradually increase the intensity of these interval workouts until you can run for 15 minutes straight. Hiking is a great way to prepare yourself for the rough terrain you’ll encounter during an elk hunt. To make the exercise as beneficial as possible, you can even wear your hunting gear for added weight. Try to focus on steep trails so that you’ll be ready to tackle the mountainous landscapes of New Mexico. Now that you’ve established a good cardio regimen, you can supplement your hiking and jogging with some strength training. If you have a kettlebell or dumbbell on hand, goblet squats are a great dual-purpose exercise that can strength both your legs and core muscles. Planks can strengthen your abs, back and shoulders, and they don’t require any equipment to do at home. Try to strength train at least twice a week for 20 minutes at a time. A few days in the gym can go a long way. 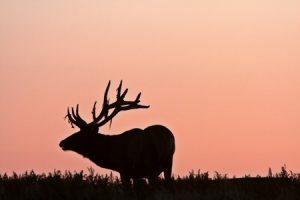 Ready to schedule an elk hunt with JACO Outfitters? Give us a call or contact us online to book your hunt today!